It’s that time of year, to invoke the old academic cliche (when is it not that time of year?). I have a stack of grading that I’ve barely touched: 31 4-page papers, plus 30 journals that span roughly the last month of weekly journal entries. Plus I have to teach those courses, sometimes be observed by my superiors teaching those courses (twice in the last week, including this morning, which is why this blog is late, apologies), and I’m supposed to have written two chapters of my dissertation by the end of this semester. Oh, and the venerable holiday of Halloween happened. So yeah, that was important to make time for too (…I’m serious!). To some of you, this schedule–basically juggling two things, teaching and dissertation–may seem pretty tame. Some of you have hundreds of students, hundreds of papers to grade, you’re writing three books, some of you teach at multiple institutions, some of you have families and kids and administrative responsibilities and…overall, I know I should be thankful that my schedule is relatively simplified, but to be perfectly honest, I’ve never taught more than one course at a time before and so am finding managing two plus general dissertation workload quite difficult. You have my permission to scoff. 1. First things first, establish reasonable expectations. I have heard of first-year Composition & Rhetoric courses requiring something like 4-page papers every week. I think we can all agree that that’s too much for all parties involved, engendering writing produced under exhaustion and duress, and stressed-out and overworked professors. Immersive, high-pressure learning environments work, arguably, for language acquisition, but not for writing, when the goals are more geared around precision, nuance, attention to detail, personal expression. So, teachers, if it is within your power, don’t construct an unreasonable syllabus! Remember that the demands of the academy and the pervasive DWYL dictum within academia ask too much of us to justify spending every waking moment grading; we simply aren’t paid enough, aren’t compensated for our labor enough, to sacrifice personal or research time for written feedback to students, who generally care more about the letter grade anyway. 2. Structure peer review into the writing process. Jana talked about this a little bit last year. At the very least, forcing them to write and print out a rough draft gets them thinking about and wrestling with their projects early on, and instills in them a sense of writing as a process, not an isolated event. I’ve found, however, that my in-class peer reviews yield mixed results, as my students are often too nice to one another to provide useful critical feedback, or they get caught up in (important, but still) local problems such as formatting the Works Cited page rather than global issues. I always distribute a handout, but have adopted different formats; on the one hand I don’t want to set them loose on each others’ papers with no guidance, but on the other I want to leave room for personal engagement and independent critical thinking. For my last essay, I had them read each other’s drafts over the weekend and write neutral summaries of them; then, in class, I gave them a handout with guiding questions for their conversations. The authors were supposed to chronicle on this handout the feedback they received, but I think they got too caught up in conversations to be able to complete that fully. I want to keep experimenting with formats that keep them responsible to each other as well as sparking independent thinking. The point is: peer review and sequenced assignments should help produce better quality work in the end, allowing for an easier grading process. 4. Maintain a routine. Set the timer, keep to it. I aim for 20 minutes per 4-page paper. Sometimes I (still) take longer than this, but having the timer go off as I’m still reading through the last page will give me added urgency to speed things up and get to the end comment as quickly as possible. I also always grade with the same blue pen, play music that peps me up, keeps me cheerful, or calms me down as necessary, and (of course) take short breaks to minimize my own crankiness. 5. Experiment with oral forms of presentation/grading. Someone in a recent Facebook discussion noted that she actually grades in concentrated one-on-one settings, which seems to me to be a little too high pressure (for both me and the student; I know I often have a hard time concentrating with someone [who has a vested interest in what I’m doing] just sitting and watching me!). But perhaps you could transform a written assignment into an oral presentation to the class. Explain to your students that this is an opportunity for them to hone their oral delivery skills, cater their arguments to a broader audience, and experiment with different kinds of electronic media, such as Prezi. 6. Skim through all the papers and stack them according to what you initially perceive as A, B, and C-worthy papers. I actually don’t do this much anymore, because when I did I often couldn’t help but engage with the work the first-time around, and then it ended up taking approximately twice as much time if I had to go through them all twice. 7. Quality over quantity; fewer assignments, higher stakes. I recently decided it was unreasonable of me to give written feedback on every single weekly journal entry (and my students probably weren’t reading/absorbing everything either), so I adjusted my policies so that students choose one out of four or so entries to submit as a hard copy for written feedback; the others, I just skim through online, keep a log of what I anticipate their grade to be, and leave short comments, briefly observing what worked in the entry and what didn’t. Those are what I’ve come up with so far; now I really need to go put these suggestions into practice! 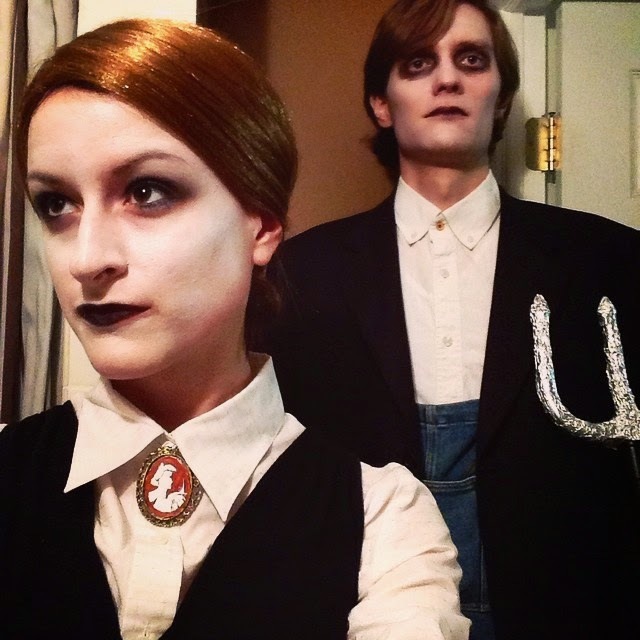 Maybe I just need to continue to channel the austere, hardworking spirit of the American Gothic couple. More tips welcome! For frequent low stakes assignments (such as daily/weekly reading responses or brief critical analyses), I tell students I will randomly evaluate a small % each time (say, 5-7 per class of 30). I rotate through the whole class once then start again, so everyone gets evaluated the same # of times and they are distributed across the term. As I'm buried in my own stack of marking, for which I try to be as efficient as possible, I have no words of wisdom to add, but I had to comment on the awesomeness of your Hallowe'en getups. Fantastic! Good day! I found your site very interesting and informative . Thanks for taking time sharing it with us. I really enjoyed reading your post. I think an approach to solve this issue would be to make your course primarily discussion based: By saying this I am talking about having two of your students giving a 3-5 min. presentation on the reading every class and then develop a debate from these presentations. Instead of journals you could have your students write discussion reports alternating with the journals and you would not have to grade the discussion reports because you can simply grade their discussion participation. To improve the results of your peer editing sessions, you might consider hosting post-peer editing writing conferences with your peer groups during your office hours; this also makes grading easier. You could of course also consider to condense the papers to 2.5-3 pages, requiring your students to be extremely precise and write to the point while you have less work. I really appreciated your post and hope this provides you with some possible approaches to reduce your workload. I missed this comment earlier; thank you, Jane Smith! Very helpful suggestions.